Leverage our 27 years of experience in data communications to integrate your legacy systems into a modern network infrastructure (e.g. X.25 to TCP/IP). Legacy systems are often built around outdated network technologies such as the X.25, LAPB or Bisynchronous protocols. Maintenance costs for these systems are rising. The public data networks they relied on have disappeared. Technical support is often difficult to find or completely unavailable, and much of your in-house expertise is vanishing. Stop-gap measures such as XOT are cumbersome and fail to take advantage of the speed and reliability of modern networks. What can you do about it? Preserve your considerable investment in legacy systems by integrating them into your modern network infrastructure with advanced technology solutions from Advanced Relay Corporation. 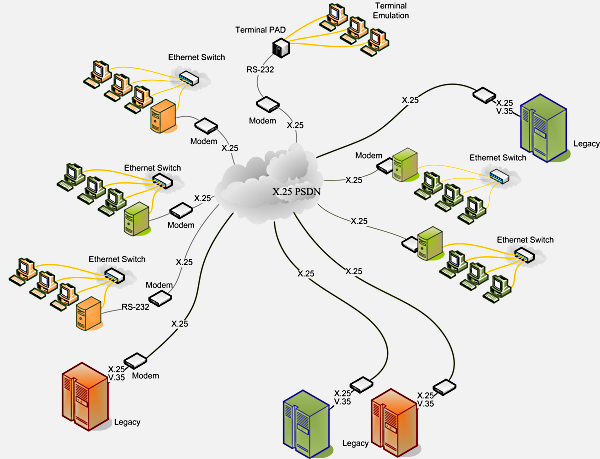 Protocol conversion solutions based on the LayGO PXSe are a cost-effective way to transition legacy systems into modern networking. Exchange outdated X.25, LAPB or Bisynchronous interfaces for modern Ethernet-based TCP/IP, allowing access to your systems and data directly through your intranet or the Internet. We supply complete solutions including hardware, software and technical support. Many of our gateway solutions automatically deliver data from legacy systems directly to workstations on your own TCP/IP network. We handle all the details of legacy data transfer protocols such as AFT, AMATPS and FTAM; you handle only what's important to you, the data itself. We are experts in data communication and customer communication with an impeccable track record. Since the release of our LayGO® Multiprotocol Toolkit in 1995, all of our customer installations, large and small, have been successful! We guarantee you the support you need and will work with you through to the completion of your project. Your success will also be our success. Contact us directly or complete our Request for Quote.